Composed of parthenolides, the feverfew leaf, also known as Bachelor’s Buttons, nourishes the central nervous system. Feverfew is also used as a natural remedy for migraine headaches. The parthenolides contained in feverfew are sesquiterpene lactones which have many health benefits. 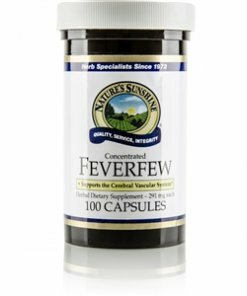 This Nature’s Sunshine product comes in 291 mg capsules of carefully grown high parthenolide feverfew.